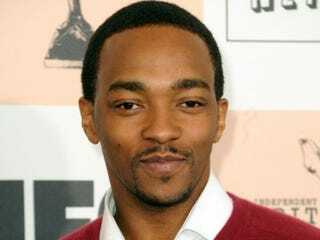 If arrogance had a name, it would be Anthony Mackie. Mackie, who is quite frankly an amazing actor, put his proverbial foot in his mouth last week in an interview with the Grio, saying that people in black Hollywood are being "lazy on their game." Mackie has had a pretty interesting career trajectory, navigating between independent films like Desert Flower and Night Catches Us and bona fide hits like The Hurt Locker and the newly released The Adjustment Bureau. He has worked with seminal directors like Spike Lee, Jonathan Demme and Kathryn Bigelow, delivering solid performances each and every time. He's the guy who made us think in Brother to Brother, care in She Hate Me and wonder in Night Catches Us. Unfortunately, Mackie has revealed himself to be a shortsighted brother who speaks some truth, but in a vacuum. While Mackie raises some important points — e.g., if black people don't tell their stories, then who else will? — he sabotaged himself by using the infamous word "lazy." You would think that a brother from New Orleans, a city that has been historically demonized because of issues of racism and poverty, would be conscious enough to realize that the term could be seized upon by those who support the status quo to make a mockery out of black people in general, and black Hollywood specifically. To suggest that black people in Hollywood are "lazy" is the height of arrogance, particularly from someone who is not a spring chicken in the industry. Mackie has been working steadily in Hollywood for almost a decade, so my immediate thought when he wondered aloud about what black people in Hollywood are doing was, what has he been doing? It's easy to cast stones when you're basking in the glow of The Hurt Locker and The Adjustment Bureau, but if making films in Hollywood is so easy, where are his? Mackie, who has done considerable work in the independent arena, should understand why the best stories are told outside of the Hollywood system: Hollywood is not really interested in telling a diverse range of black stories. And the reason is not rocket science: Those making decisions and signing checks are interested only in portraying a certain type of black experience — one that is filled with pathological behavior, raging stereotypes and neo-versions of dominant narratives in which blacks are flat, typical characters reminiscent of those that have come before. For example, the character that Mackie plays in The Adjustment Bureau, Harry Mitchell, is typical. He's a black man who sacrifices himself and his career to save a white man. Mackie does not appear to be aware of his own oppression in the Hollywood film industry, which is frightening. As for the shenanigans on Tavis Smiley's show, Mackie's statement that blacks need to stop looking at film from a "black perspective" — meaning "wanting their money up front" and being "greedy" — was mind-blowing. If you look up "sacrifice" in the dictionary, there should be a photo of a black, independent filmmaker standing there. As a filmmaker (Wooden Nickels, Four Acts) who is engaged with the independent film community, I can honestly say that if it were about the money, there is no way in hell anyone would pursue filmmaking. There is little to no money up front, and you only make money on the back end if you're really lucky. If you go to film school, the only thing that is certain is student loans, and an impoverished existence as you carve out a career. There has to be something other than greed driving your pursuit of film -– there has to be passion about film and the need to tell great stories. Black filmmakers do sacrifice and put art before money on a regular basis. Didn't Mackie just make Night Catches Us, a story set during the aftermath of the black power era? His words undermine the tremendous effort by his director, Tanya Hamilton, to bring a story with some layers to the big screen. To suggest that black filmmakers don't know how to sacrifice is just dishonest and mean-spirited. Black filmmakers are working like field slaves trying to get films made that Hollywood won't even consider making for $500,000, let alone $2 million. In the Smiley interview, Mackie wondered aloud what black filmmakers like Spike Lee and John Singleton are doing now. After Do the Right Thing, Malcolm X and Miracle at St. Anna, people should be throwing money at Spike, but no, he's probably out raising money for his next film, just as he had to do to complete Miracle at St. Anna. That was an extraordinary film, and it took everything for him to get it made because for some reason, black soldiers as saviors are just not as interesting to Hollywood as white soldiers as saviors, which we see over and over again. For the record, the Hughes brothers just made The Book of Eli in 2010. Did Mackie even see it? What Mackie should have said is that there is always the possibility that a black film can get made, but the type of film that can be made, even when backed by heavy hitters, is limited. That may, in fact, influence whether black actors even want to pursue producing and directing films in the industry. Which leads me to my last point: Mackie hit the nail on the head when he talked about Hollywood being a business. The challenge for black filmmakers, whether they are struggling in the indie world or working with $20 million-a-film actors, is to make a film about black people that is new and different and speaks to Hollywood's bottom line. That is hard to do when the industry has such a narrow view of blacks, undoubtedly fueled by people like Mackie, who put forth an embarrassingly narrow view of blacks in the Hollywood film industry. While Mackie went out of his way on Smiley's show to point out that he wasn't saying all blacks are greedy, to suggest that greed is what's keeping black actors and directors from making films in Hollywood is wrong. Perhaps the need to survive is keeping them from making films in Hollywood? There should be room for all types of stories about blacks in Hollywood. Calling out blacks about the lack of stories told in Hollywood and not calling out Hollywood is not cool. Sometimes the truth is hard to hear, but Mackie's truth smacks of arrogance and self-loathing. Before telling stories about "lazy" and "greedy" black filmmakers who lack vision, perhaps he should consider the limited scope of his own vision.